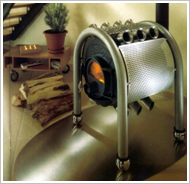 Canadian heating furnaces, known in Canada and the U.S. as free flow (free flow), it is very convenient and practical. 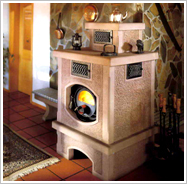 Using the Canadian furnaces - a simple and effective solution to the problems that arise usually with traditional stoves and fireplaces, as in these systems most of the heat in the smoke appears from the chimney of an open fire. Canadian furnaces are very beneficial because they allow highly efficient use of the most common types of fuel - wood, peat, wood and other waste. Works on the principle of wood-oven gas generator, that is "the glow of burning." Fuel is burned completely in two stages. In the first chamber, the process of decay and formation of flue gases, and on the second, these gases after burned to end thanks to the air supply into the secondary chamber. Wonder stove extremely economical efficiency reaches to 75% of the index. The furnace is that she, through pipes, encircling the firebox, heated and mixed evenly throughout the volume of the air space. Since wood does not burn and smolder, one full tab missing for 6-8 hours or more. That the oven is not only bestowed the life-giving heat, but also pleasing to the eye, it can be made into a fireplace that complements any interior. 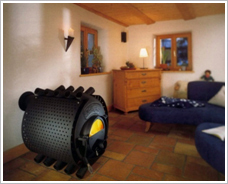 A mounting the duct system (air heating), you can heat your entire vacation home. In this case, you get a fast heating of the air in rooms of any possibility of heating the room (during the day - one at night - others), non-volatility, lack of operating costs, and many other obvious advantages. Area of application is very wide ovens. These are industrial and household premises, shops, workshops, service stations, summer houses, greenhouses, etc. The furnace can also be used for drying lumber. Particularly relevant to use the oven, where there are no other sources of energy (electricity, district heating, gas) or energy supplied constant.